What is the Water Quality Assurance Revolving Fund (WQARF) Program? Created under the Environmental Quality Act of 1986, the Water Quality Assurance Revolving Fund (WQARF) program supports ADEQ in identifying, prioritizing, assessing and resolving the threat of contaminated soil and groundwater sites in the state. The program conducts statewide efforts using state funds and oversees privately funded cleanups as well. • Proportionate Liability — Liability for the contaminated site’s cleanup costs is proportionate rather than joint (as it is in federal regulations). These cleanup costs are proportionally allocated among responsible parties by ADEQ using a process defined in statute. ADEQ is responsible for identifying responsible parties and allocating cleanup costs. A non-judicial allocation hearing process is available for dispute resolution. • Settlements — To provide a favorable alternative to litigation, ADEQ is authorized to offer a 25 percent discount to responsible parties who settle after they’ve been notified of their proportionate share of liability. • Program Funding — The adoption of a proportionate liability system increased the need for adequate and dedicated program funding. To ensure such funding and pay allocated, non-collectable orphan shares, WQARF reform legislation provides for an annual $18 million expenditure. The program is dependent upon the direct transfer of funds from legislative appropriations, corporate income tax, cost recovery and special fees. • Site Prioritization — Sites are prioritized with a greater emphasis on risk to human health. The statute provides a process to score sites according to actual and potential exposure to hazardous substances. This score and other factors are considered when prioritizing the expenditure of WQARF funds. • Cleanup Methods and Goals — WQARF reform provides increased flexibility in selecting groundwater cleanup methods and levels. ADEQ adopted and applies remedy selection rules that incorporate an analysis of a range of cleanup options. The statute clarifies that the cleanup need not always result in achieving drinking water standards within the aquifer. • Community Involvement — Enhanced community involvement is required at all stages of cleanup. The statute establishes a process to encourage active community involvement, including provisions for notices, plans and the formation of a Community Advisory Board (CAB) for each site. How does a site become a WQARF site? The WQARF process begins when ADEQ receives information about a release or potential release of a hazardous substance. This information may come from a citizen complaint, from an investigation conducted by ADEQ or from an investigation conducted by an outside party. ADEQ assesses whether the information is credible, if another regulatory program has jurisdiction, or if the site is already being cleaned up voluntarily. If a potential release has occurred and no other regulatory program has jurisdiction, a WQARF Preliminary Investigation (PI) is initiated. The purpose of the PI is to confirm the release or potential release and determine whether further investigation or action is necessary. The PI is not a full investigation to determine the extent of the contamination, nor is its purpose to identify the parties potentially responsible for the contamination. If ADEQ determines that no additional investigation or action is necessary, the site is removed from further consideration. 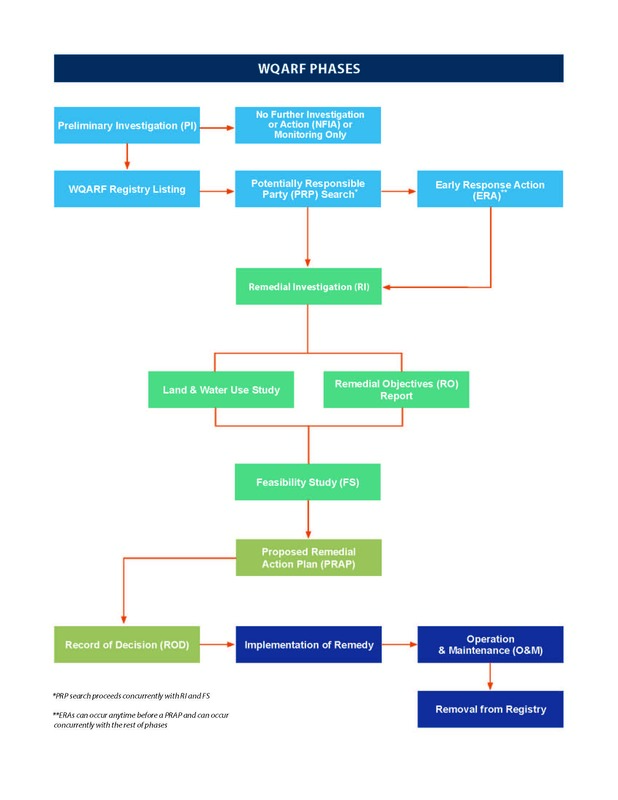 If ADEQ determines that additional investigation or action is necessary, the site is scored using the eligibility and evaluation model and is eligible for listing on the WQARF Registry.